Whether you buy water softener salt pellets, solar salt or rock salt, all the salt choices you need are under one trusted Diamond Crystal® Salt brand. We stand by the quality of each and every bag of Diamond Crystal® Water Softener Salt. 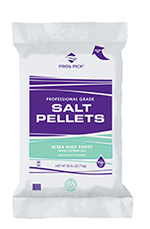 Our 2-Handle Diamond Crystal® Water Softener Salt Pellet bags are made from 50% recycled materials. The new packaging contains layers made from reground resin. This allows us to cut down on excess waste by 50%. For more information on Diamond Crystal® Salt products, please visit our consumer site at www.diamondcrystalsalt.com. Cargill Salt also helps water softener salt dealers and distributors win the water softener salt war by providing top-quality Pro's Pick® water softening salts. We support dealers and distributors with our extensive national distribution network and with a strong dealer-directed, co-op advertising program. Clean, economical salt for all water softeners. High purity salt, evaporated naturally by the sun and wind. Pure salt, typically 99.6% sodium chloride crystals. Formulated to resist mushing and bridging and to minimize brine tank residue. Formulated for use in all softeners where iron content in water is high. Highly effective, FDA approved rust-removing additive, considered non-toxic to bacteria in septic systems to help prevent rust stains on laundry and household fixtures. High purity, large crystal salt evaporated naturally by the sun and wind. Typical of 99.6% pure salt. Formulated to minimize bridging and mushing.